Trains are rare in Peru, with rail networks limited to a handful of lines in only a few sections of the country. The train lines that do exist, however, offer travelers an interesting -- and at times spectacular -- alternative to domestic flights and long-distance bus travel. The Southern Network is the largest train network in Peru. Operated by PeruRail, it connects major tourist destinations such as Cusco, Machu Picchu (Aguas Calientes) and Puno. PeruRail’s Andean Explorer departs from Cusco’s Wanchaq station on its journey south to Puno and Lake Titicaca. The train passes through ruggedly beautiful scenery on its lengthy 10-hour journey, climbing as it leaves Cusco before eventually reaching the expansive plateaus of the Peruvian altiplano. There are three departures each week from November to March, with four weekly departures from April to October. The Ferrocarril Central runs from the port of Callao, through Lima and onto La Oroya in the central Andes, at which point it splits into two branches: north to Cerro de Pasco and south to Huancayo. 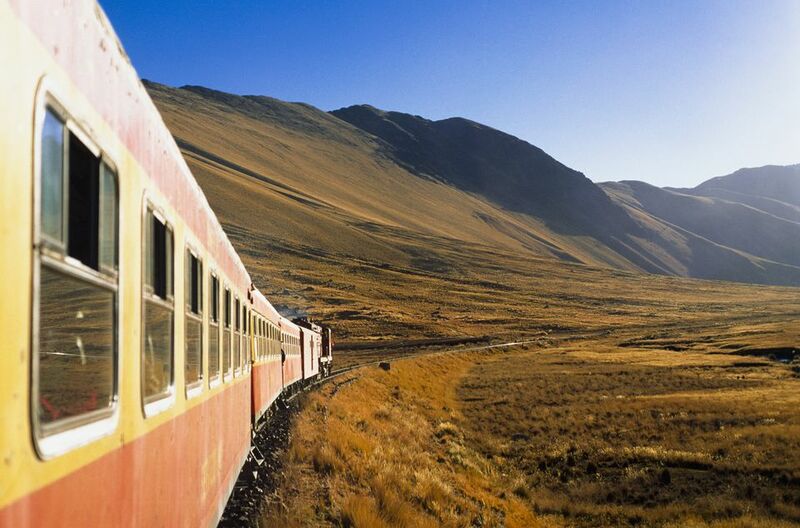 The Lima to Huancayo route is arguably the most spectacular train journey in Peru. The train passes through 69 tunnels, crosses 58 bridges and negotiates six zigzag switchbacks on its way to Huancayo. As it climbs through the Andes, the train reaches a maximum height of 15,689 feet (4,782 m) above sea level, making it the second highest train route in the world. Passenger services are extremely limited, with only one or two departures each month. Upcoming departures are announced on the ​​Ferrocarril Central Andino website; advanced bookings are necessary. The tourist train departs from Desamparados station in Lima, with the trip to Huancayo taking about 12 hours. Located in the far south of Peru and cut off from any other lines, the isolated Tacna to Arica rail service runs passengers across the Peru-Chile border. The 37-mile (60 km) route from Tacna to Arica takes a little over one hour to traverse, making it a slow but interesting alternative to the standard road crossing. There are typically two departures daily from Monday to Saturday, one leaving early in the morning and the other in the late afternoon. Train buffs should set aside some time to visit the Museo del Ferrocarril (Rail Museum) located in the Tacna station. The Tren Eléctrico (Electric Train) is an ongoing and often controversial transportation project in Lima. The ultimate aim is to construct five interlinking train lines that will crisscross the Peruvian capital, helping to unclog the city’s choked and polluted roadways. At present, Line 2 is under construction. Line 1 is complete with 26 operational stations, stretching from one side of the city to another. Transportation projects in the capital rarely run smoothly, to schedule or to budget, so the five lines may take some time to complete.